Newcastle slumped to their fourth successive defeat as an unfortunate Lee Bowyer own goal assisted Charlton to victory at The Valley. Addicks striker Darren Bent scored his 20th goal of the season before former Charlton midfielder Scott Parker's 30-yard effort levelled matters. The hosts were presented with the lead again when Craig Moore's clearance flew into the net off an unlucky Bowyer. And the points were wrapped up with substitute Jay Bothroyd's late header. The defeat was perhaps harsh on a Newcastle side that suffered FA Cup quarter-final heartache in midweek when they crashed out of the competition at Chelsea. For all their possession in the second-half, they failed to get back on level terms to provide their flagging season with a much-needed lift. And it was their shaky defence that was to prove their downfall again - as so often has been the case this season. Shay Given had to come to the visitors' rescue to deny Darren Bent when the Charlton striker was presented with a clear sight on goal early on following Jean-Alain Boumsong's failure to deal with a through ball. But Darren Bent only had to wait until the 24th minute to enhance his chances of a place in the England squad this summer with his 16th goal of the Premiership campaign. It came about from more poor defensive play as Moore's rash challenge on Jerome Thomas saw referee Mike Halsey point to the spot and Darren Bent finished with ease. Newcastle, though, continued to push forward and Nolberto Solano dragged a shot wide before Parker replied in style with a thunderbolt. 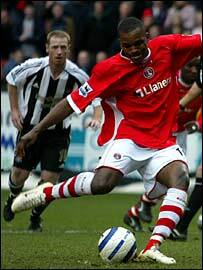 Newcastle's joy was short-lived as two minutes later, in Moore's attempt to clear a Charlton attack, the ball was smacked into the feet of Lee Bowyer to end up in the back of the net. Charlton almost returned the favour of scoring an own goal after the break when Chris Perry's clearance went inches past the post. Alan Curbishley's side, meanwhile, were limited to sporadic attacks in the Newcastle half, but were given the perfect chance to go 3-1 up when Marcus Bent sprung the off-side trap from Matt Holland's ball over the top. Marcus Bent had time to charge at goal, but opted for a first-time effort which went hopelessly off target. With time ebbing away for Newcastle to get something from the game, Peter Rammage fired over the bar from close-range with 10 minutes to go as their spark died. But there was enough time for Charlton to add a third when substitutes Dennis Rommedahl and Bothroyd combined for the latter to score with a close-range header. Charlton boss Alan Curbishley on Lee Bowyer's own goal which made it 2-1: "It was important to get back into the game straight away. "I thought it was the turning point of the game, although it was on a knife edge in the second half. "I didn't know if we'd get our third or they would equalise, but we had to wait until the 89th minute to wrap it up." "All three goals were really poorly defended and should not happen at this level. "It's a body blow when you concede weak goals like we have and our problem has been our inconsistency. "We have to set our standards much higher and for us to lose 3-1 isn't encouraging at all and for Newcastle it isn't good enough." Charlton: Myhre, Young, Perry, Hreidarsson, Powell, Kishishev, Holland, Hughes, Thomas (Rommedahl 76), Marcus Bent (Bothroyd 88), Darren Bent. Subs Not Used: Andersen, Euell, Spector. Goals: Darren Bent 24 pen, Bowyer 37 og, Bothroyd 89. Newcastle: Given, Carr, Boumsong, Moore, Ramage, Solano (Dyer 45), Bowyer, Parker, Emre, Shearer, Ameobi (N'Zogbia 71). Subs Not Used: Harper, Faye, Clark.